For the next ten days, we will be featuring one social media marketing tip to consider implementing in your marketing plan. Here are some interesting statistics. 84% of millennials use YouTube. Among Gen Xers, that number is 58%, and for Baby Boomers, that number is 43%. Despite these impressive numbers, only 9% of small businesses are using the channel. Organizations may be missing a big opportunity to get in front of their target market by not doing so. 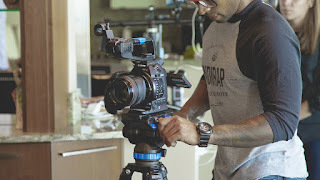 Why should a small or medium business produce videos and upload to their websites or YouTube? First, there is the visual component. On Facebook, posts that include a photo receive more Likes. There is an 87% interaction rate when a photo is included. On Twitter, a photo can boost the likelihood of a retweet by 35%. In comparison, the likelihood of a retweet with a hashtag is 16%. People are drawn to the visual elements of websites, Twitter, Facebook, and the like. Possibly a more compelling reason to use video is search engine optimization. YouTube is owned by Google. Posting videos can help improve your website ranking, as well as conversion rates. Videos also help personalize an organization's marketing efforts. Videos position companies or individuals as experts in their fields. Videos should include a CTA, or Call to Action. What do you want viewers to do? Subscribe to your YouTube channel? Visit your website? Tweet something about you? Make a purchase? Be sure to be specific. Posting your video to your website has been shown to increase web traffic. According to a Comscore study, visitors spent an additional two minutes on a website after watching a video. Visitors are more likely to watch a short video on your website than read through an article on the same topic.If you sell a product, a video enables you to show, not tell, the special features or benefits of your item. If you offer a service, you can use a video to explain some aspect of your business.